Sometimes we get bizarre ideas about smoking various foods and the flavor profile it will impart, things that you probably might not ever think to smoke — like butter. Inspired by adding a little something extra to a rib eye steak to just crush the flavor, smoked butter — or more specifically smoking cream and making our own butter –was a challenge we were willing to take on. What could possibly make this grilled steak any better? The answer — smoked butter. We were originally challenged with the idea of making smoked butter last summer at the request of a friend who was writing a story about it. We had the vessels to experiment, so we accepted the challenge. 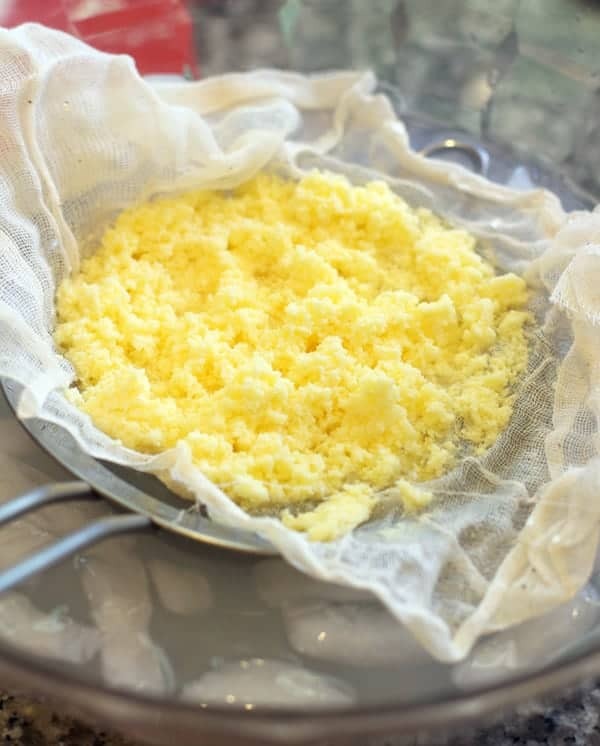 It was a lot of fun, and we made some delicious butter… but the recipe was pretty detailed, requiring the cream to be smoked, then fermented overnight, and then chilled, and then churned. Overall a 2-day process. Most regular (not smoked) butter recipes are pretty simple and straightforward — blend cream until it turns into butter (for the most part). So we decided to simplify the process for our own smoked version. If you Google “smoked butter” you’ll find that many people will just place a regular store bought stick of butter on a cold smoker. 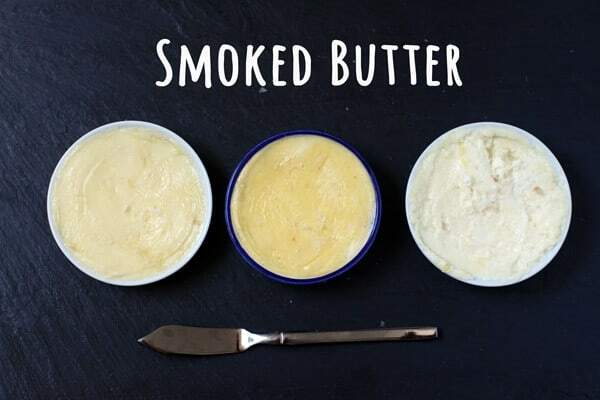 But we didn’t want just any smoked butter, we wanted to know how to best impart a mild smoky characteristic to high quality cream and churn into a creamy buttery yummy goodness. That meant making our own butter, from scratch. Use quality cream. We found that the best flavor came from cream from a local dairy. The color alone was evident versus using something you can get at just any box grocery store. Plus the local cream was a thicker consistency — like real fresh cream, not thin and watered down. Use a stand mixer (not blender or food processor). Use cold cream! 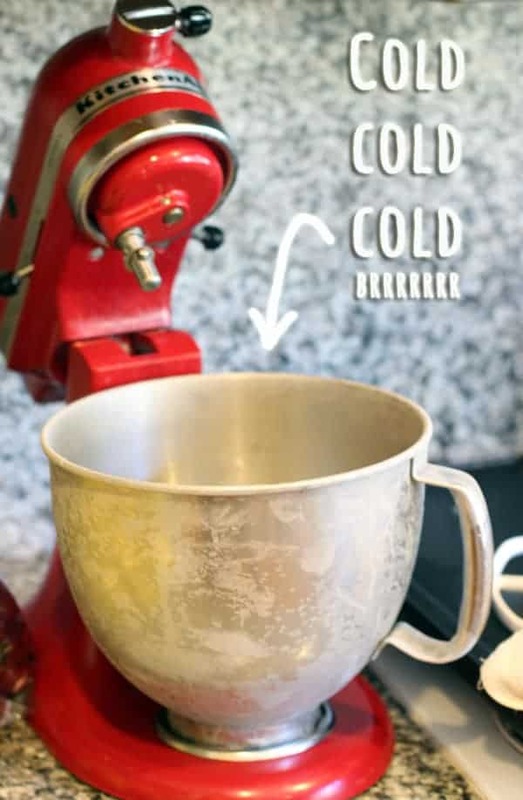 Whatever you do and whatever you read, cold matters when actually churning, or in our case, mixing the cream in our KitchenAid stand mixer. Homemade butter doesn’t last as long as store bought, for a number of reasons, so be prepared to eat it up quickly. It should last about a week. I’ve got a few ideas for your smoked butter below. Really there’s only one (or two if you add salt) ingredient involved. So using the best quality cream is important. We experimented with cheap store bought cream from a regular supermarket, a higher quality organic cream, and a cream produced from a local farm. The taste of the butter from the local farm cream was far superior! I read several articles on making butter and watched several YouTube videos with people making their butter in a blender or food processor. So we tried both. When I attempted making butter in those appliances nothing happened. It’s possible that, because I have a Blendtec, which gets really hot after about a minute of high blending, the heat from blending for too long kept the cream from turning into whipped cream and then butter. We had similar results with the food processor (except it didn’t get hot). When we transferred the cream to the stand mixer (we have a KitchenAid stand mixer) it all came together. This brings us to the temperature of the cream. The temperature of the cream is important. Some articles don’t mention a recommended temperature at all, some recommended room temperature cream, others cream between 60-70 degrees. I’m sure that works, but it would take forever for it to come together. When I attempted warm or room temp cream, again, nothing happened. I just stood there and watched cream blend and blend, never turning into anything but a liquid mess. When we used cold cream (and a cold mixer bowl! ), it all came together. We found this is an important step. Use cold cream and a cold mixer bowl. There’s no rule for how long this should take. Some articles I read said the cream should separate into butter after only 5 minutes. Another article said 30 minutes. In our experiments (remember we did several! ), it took on average from 10-15 minutes for the cream to turn to butter. At around 5-8 minutes (mixing on med-high speed) is when the cream turned to fully whipped cream, then after continuing to whip a few more minutes it will eventually separate and the liquid (buttermilk) will separate from the solid (the butter). That’s when it’s time to turn off the mixer and rinse your butter. Overall it’s really simple (as long as you avoid those mistakes). Smoke the heavy cream in a glass bowl at 200 degrees for about 90 minutes. We experimented at 60 min, 90 min, 120 min, and 180. We liked the flavor at 90 minutes the best. 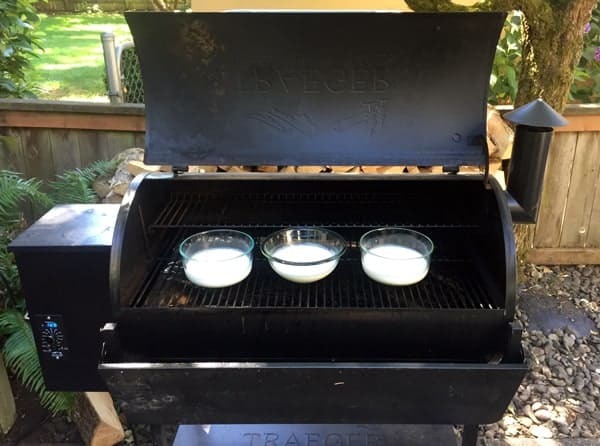 You can go longer for more smoke influence, but the key is to keep the cream from boiling (212 degrees Fahrenheit), if you keep your heat at or just below 200, you avoid the temperature of the cream from boiling. Then, let it cool before churning. You’ll want to put it in the refrigerator to get a nice chill. When you churn, make sure the cream comes straight from the fridge and place in a cold mixing bowl (we put our metal mixing bowl in the freezer for about 5 minutes to get cold). When you churn, it takes time. It’ll start by looking like whip cream… and then… well… keep going. Eventually the solids and liquids will separate, and keep going until you know you’ve extracted as much of the solids. This can take anywhere from 10-15 minutes (or longer), but for us it usually starts to come together around the 10 minute mark. Then rinse the solids in cold water (or dip in an ice bath). 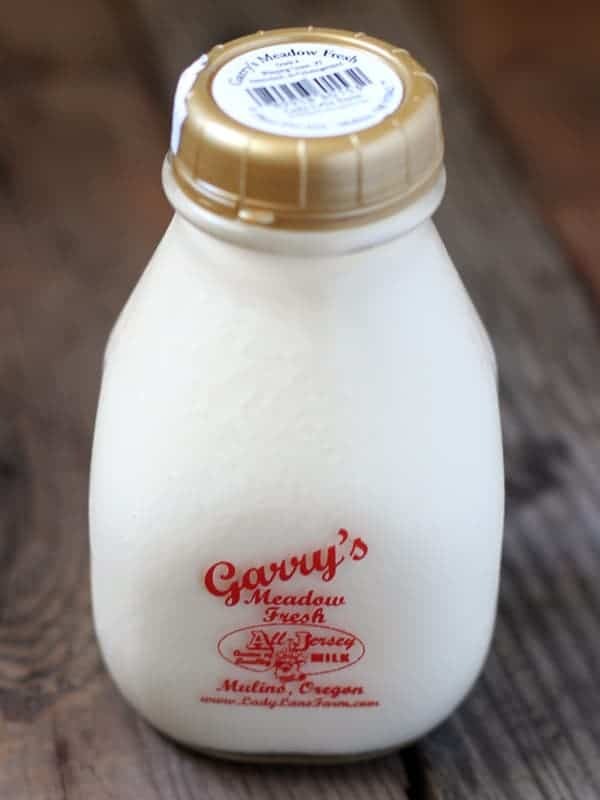 This will help get rid of any remaining buttermilk and help it last longer in the refrigerator. Roll it up in the form you want (we like to shape it into a roll similar to a regular stick of butter using plastic wrap to help shape it) and keep cold until service. To salt or not to salt? Feel free to add a bit of salt (about a teaspoon or less) to either your cream mixture before it’s whipped. Or you can do what we did. Add it to the butter after it’s been rinsed, but before rolling it into a stick. This will help the flavor of the butter to pop. Totally optional though! But like the cream, use the best possible salt that you have. 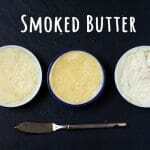 How to make homemade smoked butter. It's easy. It's all about the technique. Smoke the heavy cream in a glass bowl at 200 degrees for about 90 minutes. You can go longer for more smoke influence, but the key is to keep the cream from boiling (212 degrees Fahrenheit), if you keep your heat at or just below 200, you avoid the temperature of the cream from boiling. Let cool to room temperature, then transfer into refrigerator to get a nice chill (about 1 hour). When you churn, make sure the cream comes straight from the fridge and place in a cold mixing bowl (we put our metal mixing bowl in the freezer for about 5 minutes to get cold). Place cream in mixer and turn on med-high. After a few minutes the cream should turn to whipped cream. Keep going. Eventually the solids and liquids will separate, and keep mixing until you know you’ve extracted as much of the solids. This can take anywhere from 10-15 minutes (or longer), but for us it usually starts to come together around the 10 minute mark. Then rinse the solids in cold water (or an ice bath) to get rid of any remaining buttermilk and help it last longer in the refrigerator. Roll the butter into the form you want (we like to shape it into a roll similar to a regular stick of butter using plastic wrap to help shape it) and keep cold until service. Feel free to add a bit of salt (about a teaspoon or less) to either your cream mixture before it’s whipped. Or you can do what we did. Add it to the butter after it’s been rinsed, but before rolling it into a stick. This will help the flavor of the butter to pop. Totally optional though! What to use smoked butter on? Well, anything you put regular butter on. Want to make the best steak of your life? 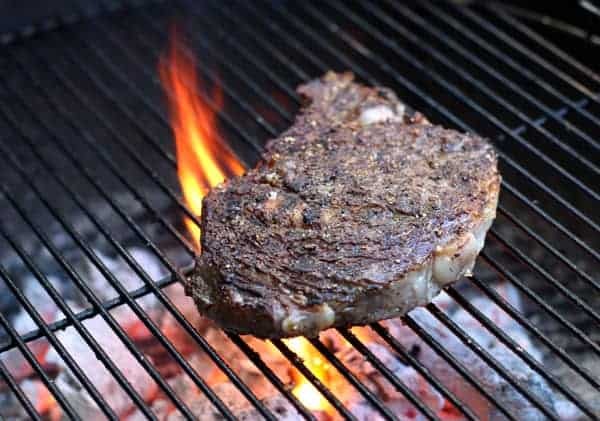 Grill your steak, and just before taking it off the grill place a dollop of smoked butter on it and let it melt into the delicious meat. 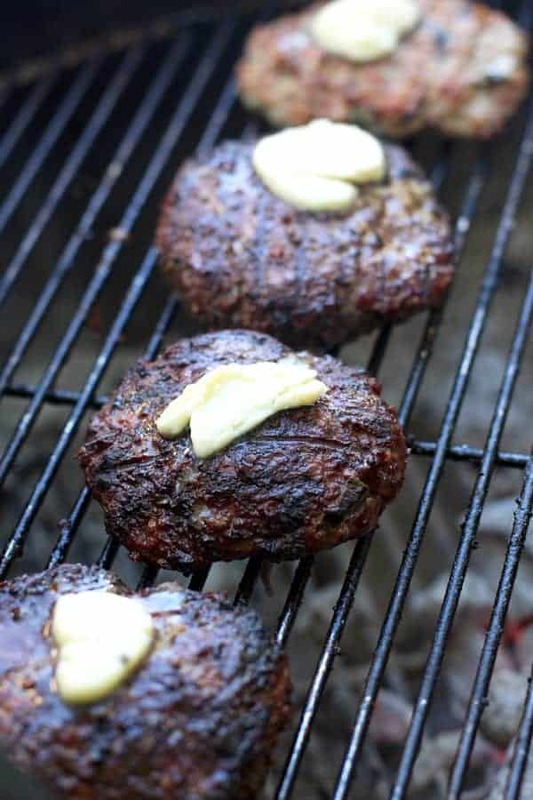 Amp up a regular burger by doing the same thing. 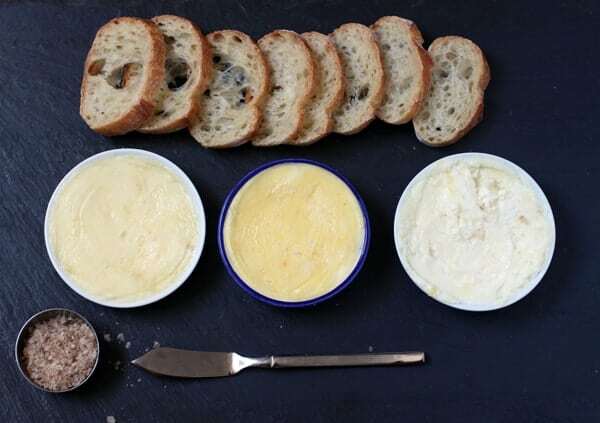 Put out some cut up bread at your next party and let guests try the fresh homemade butter. Top with smoked salt or regular sea salt for an added touch. They will be so impressed by your efforts! 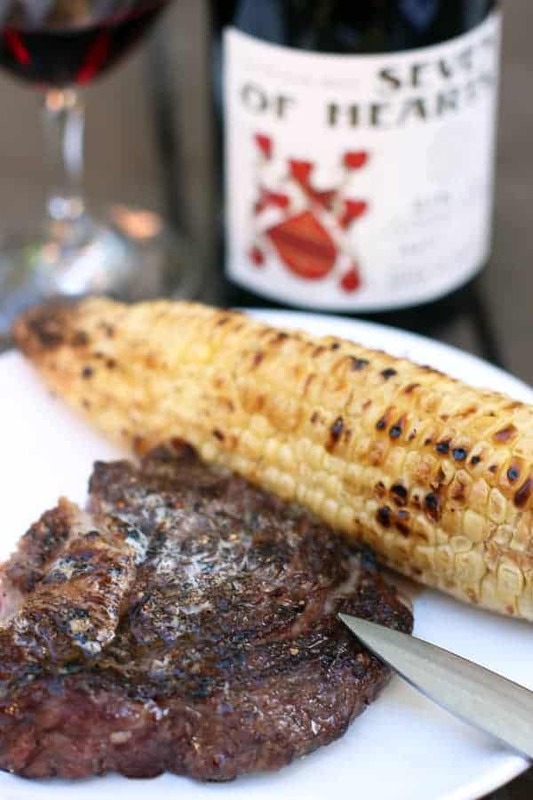 Use it in place of regular butter on your grilled summer corn. Place on breakfast toast, biscuits, or savory scones. Next time you make scrambled eggs start with a tablespoon of the smoked butter. You may be surprised by how tasty they come out. Add some to your next batch of mashed potatoes. Grilling up shrimp? Toss with some smoke butter. Toss your next batch of homemade popcorn in some melted smoked butter. Yum! Use in risotto. Better yet, use in this smoked sausage and mushroom risotto! What would you use it on? For more recipes check out the Recipe Index. If you like this recipe we’d truly appreciate it if you would give this recipe a star review! And if you share any of your pics on Instagram use the hashtag #vindulge. We LOVE to see it when you cook our recipes.